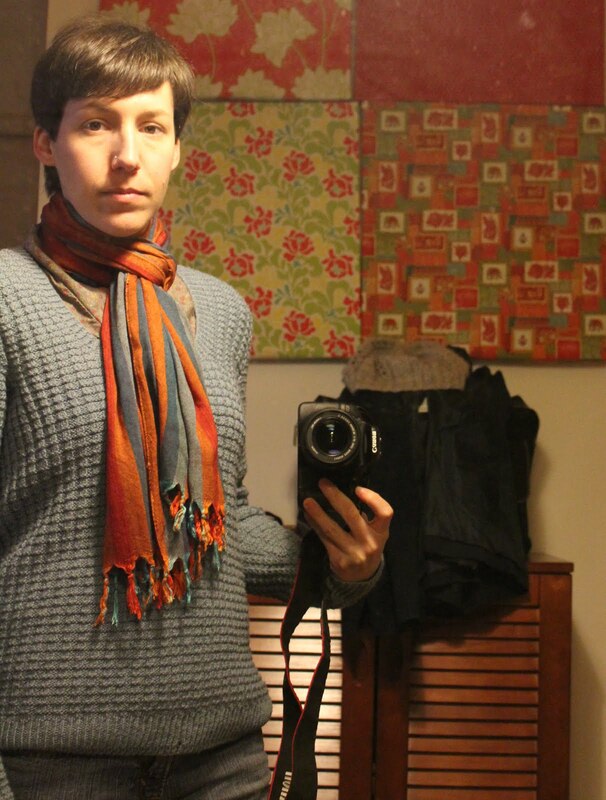 I've been inspired by these blog posts about re-evaluating one's wardrobe and style. And I decided to do something I had heretofore resisted: take daily outfit photos. I am so not a fashion/style blogger and I am not approaching it from that angle (as the photos below will leave you in no doubt!). I simply want to have concrete data about how often I wear certain pieces. I have suspicions that I recycle the same 7 things every week. Maybe 10 max. I think this will help me plan not only for future projects, but also re-evaluate how well certain items hold up to wear and tear. If I wear my turquoise sweater (see photo below) as often as I think I do, then I am even more impressed by Rowan's wool quality. I'm certain that various pieces get worn simply because I don't have a good alternative. Nevertheless it's telling that I'm willing to wear those articles of clothing instead of others hanging in my closet/stuffed in my drawers. I wore this to teach on Saturday morning and I wore it for the rest of the day. The sweater is hand-knit by me and the rest is RTW. I think I could use the pants as a good block for straight-leg/skinny pants one day. I wore this to the grocery store on Sunday (today) and then around the house the rest of the day. 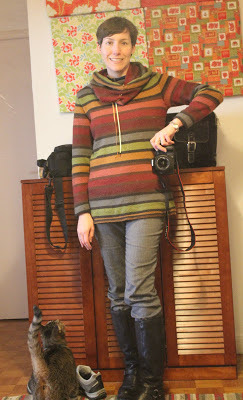 The sweater is hand-knit by me and the shirt is a me-made Burda pattern that is now reserved to only going under things. The rest is RTW, except I did wear my new Dolce Slouch hat, seen perched on top of my jacket in the background. Check out my fun scarf that I got from Indira's generous donation! I look terrible here 'cuz I feel bleepin' terrible! I have yet another winter cold. Blech. I know that I already wore the striped sweater at least once this week (on Monday) and the blue sweater as well (but I forget which day). Your knitting is gorgeous, very talented! Interesting! I feel the same way-- pretty sure that I just wear the same couple of things over and over. Hi Donna! This is an interesting project. Actually I think I use about 50 per cent of what is in my closet...But how can you NOT sew all those pretty dresses! I think this will be a fascinating project! I am doing a similar thing with my sketches.. assessing what I actually wear. Of course, the seasons dictate everything. When we are getting very hot weather I live in certain selection of a few dresses, tops and shorts. As the weather cools down I migrate to another "set" of things, as it gets still colder a few pairs of jeans are added into the mix and shorts and light dresses are left hanging etc etc. Still I am looking forward to seeing what I actually wear, and how often; down in black and white ... or colour, as it may be! This is a fascinating idea. I think you´ll learn tons from this, seeing that photos (unedited ones) don´t lie. Good luck with this, and I am looking forward to seeing your stashbusting plans! Great idea Donna! It´s necessary to think about our sewing likes and results and what is wearable and what not.